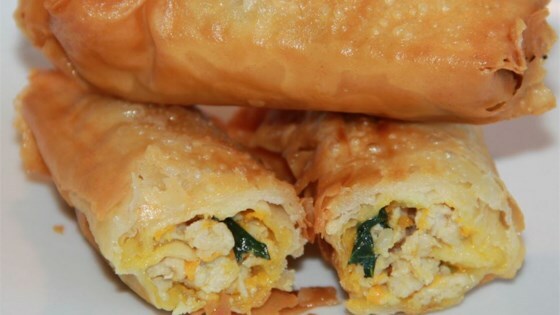 "After many experiments, this is my ultimate egg roll recipe." Heat oil in a large, heavy saucepan or deep-fryer to 375 degrees F (190 degrees C). Place ground turkey, 1/2 the ginger root and approximately 1/2 the garlic in a large, deep skillet. Cook over medium high heat until evenly brown. Heat sesame oil in a wok over medium high heat. Stir in remaining ginger and garlic. Mix in bok choy, carrots, green onions and soy sauce. Cook and stir until vegetables are tender but crisp. Remove from heat. In a medium bowl, mix ground turkey and bok choy mixture. Fill a double thickness of wonton wrappers with approximately 1 tablespoon of the turkey and bok choy mixture. Fold wrappers over the filling, and moisten seam to seal. Repeat with remaining wrappers and filling. In small batches, deep fry the filled wontons until crisp and golden brown, 3 to 5 minutes. Discover a 300-year-old family recipe for shredded pork egg rolls. I used hot chili sesame oil instead of the sesame oil. It gave it a good spicy bite. These were really good a lot better than take out! Will try them again. these were pretty bland and boring. These egg rolls are actually very good. I did'nt change anything except I added some soy sauce to give it a little more flavor and everyone really enjoyed them.